A Landice L7 model treadmill sits in Hadley Village. The Erie County District Attorney’s office said UB has a Landice L7 model treadmill, purchased by former Campus Living director Andrea Costantino. UB, however, says it has no record of Costantino’s treadmill returning to campus. Former Campus Living director Andrea Costantino used $4,200 in state money for a personal home treadmill, her very own Landice L7 model. The same treadmill model currently sits, ready for use, in the Hadley Village fitness center. Upperclassmen use the Hadley Village treadmill every semester for their daily workouts, but UB said it has no record of Costantino’s treadmill returning to the university. Still, the Erie County District Attorney’s office said UB has the treadmill, and it is a Landice L7 model. Costantino, who was Campus Living director from 2012-17, plead guilty to grand larceny in the fourth degree in September 2017. Since, Costantino has paid a $14,664 restitution to pay back the money she stole from the university. This money included the money she spent toward her treadmill purchase, according to UB Spokesperson Kate McKenna. UB officials, however, could not verify with The Spectrum whether the Hadley Village treadmill was originally owned by Costantino. McKenna said since UB doesn’t have a record of the treadmill’s return, UB cannot verify if her treadmill is in Hadley Village. The Hadley Village treadmill, a Landice L7 model, is the only Landice model in the three Campus Living fitness centers on North Campus. The treadmill does not have a serial number sticker on it, unlike all of the eight other treadmills owned by Campus Living on North Campus. The treadmill is worth around $4,200 on the market, and all of the other Campus Living fitness center treadmills (True Fitness and Life Fitness brand treadmills) don’t sell for that price on the market. Nivetha Pushpanathan, a Hadley Village resident and junior biomedical science major, said she works out on the Landice treadmill. Bridget Mahr, a Hadley Village resident, also uses the treadmill in the fitness center. Mahr said she wants to know why UB has no record of the Costantino treadmill’s return. “I currently work out five days a week,” said Maher, a junior sociology major. 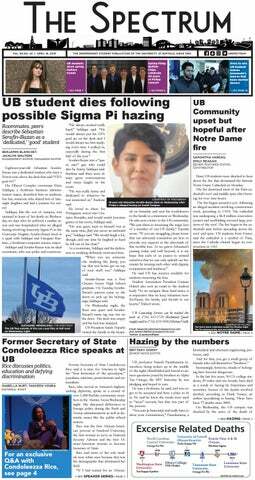 Arsh Issany, a features staff writer, contributed reporting for this article. Benjamin Blanchet is the senior features editor and can be reached at benjamin.blanchet@ubpsectrum.com and @BenjaminUBSpec on Twitter. Benjamin Blanchet is a graduate student and student journalist based in Buffalo, New York. Aside from The Spectrum, Blanchet has appeared in Brooklyn’s ARTSY Magazine and New York’s RESPECT. Magazine.